Even the dimmest network executive knows that people blog, tweet, and text about the TV shows they enjoy. Who cares what the high-paid TV reviewers say anymore. Nowadays, it's all about what you and your social circle think. FOX gets this and has taken its marketing to a whole new level: empowerment. In conjunction with Klout (a website that measures your influence on Twitter), FOX launched two campaigns to get people talking about its new show Lone Star, which premieres tonight (to qualify, you had to be considered influential, as determined by your Klout score). 1) FOX hosted an exclusive pre-screening of Lone Star for social media influencers at its Century City lot in Los Angeles. The party, of course, included fancy food, lots of drinks, and high-quality networking. 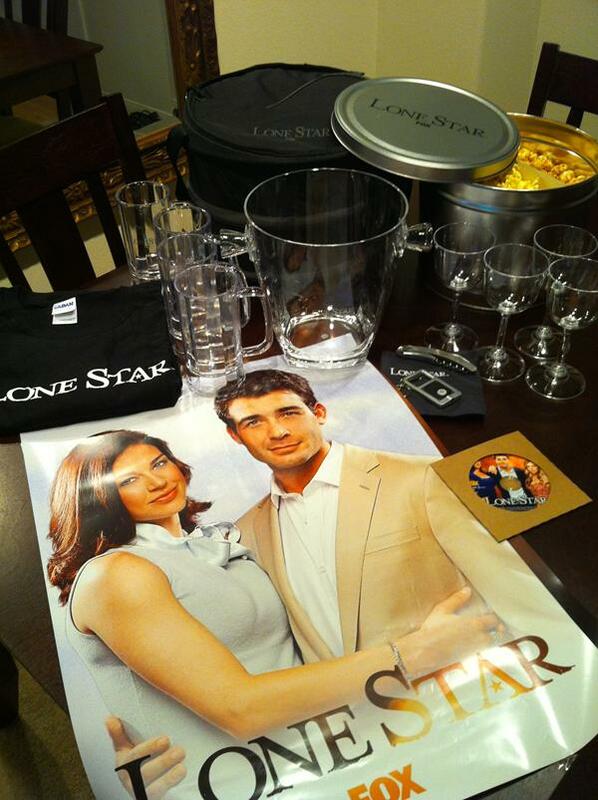 2) If you were unable to attend the screening, you could have a party pack shipped to you (pictured above). The kit included a DVD of the premier episode of Lone Star* and everything you'd need to host a screening for you and your friends (e.g. wine glasses, beer mugs, ice bucket, popcorn, Beer Nuts, napkins, bottle opener, cooler, poster, t-shirt, and Godiva chocolate—my kit was missing the chocolate, nuts, and ice bucket, so a big, fat thumbs down to the guy who put my kit together!). By giving those who are active in the social media space a sneak peek at Lone Star, FOX got a jump on creating buzz around the show. The network didn't just wait for people to start talking, they empowered them to start talking. That is major. As marketers scramble to evolve in the new media space, and TV networks are suffering declines in viewership, I think FOX's Lone Star campaign is a great example of what's to come. Traditional media needn't be afraid of social media. Social media is the future and citizen journalism is powerful. So, welcome to the decade of the most influential people out there, Average Joe and Plain Jane. We're here to stay and we have opinions. Speaking of opinions, what are your thoughts? Sound off below (you know you want to). * My two-cent review: Lone Star is a solid drama that's different from anything you've seen on network TV. When the show hit the five minute mark, I could tell I was in for a ride. In the closing minute of the show, I realized that ride was a roller coaster. Two enthusiastic thumbs up! DISCLAIMER: As indicated above, I did receive a party pack from Klout/FOX. That in no way influenced what I've written in this post (especially since I didn't get the chocolate). My party pack didn't have the chocolate either! I agree with you though; it's definitely different and out there. We had a little party at Stacey's house and watched it on Saturday night. I'm anxious to see what will come out of it. I didn't get Godiva chocolates either, haha. I love that you focused on the marketing of this show because without an audience there will be no Lone Star. I really enjoyed the pilot and hope that this campaign will generate enough buzz to get people watching. It's smart marketing and I hope Fox sees a return on the investment. Got my party pack (no chocolate!) but LOVE the marketing angle. I haven't had a spare moment to watch anything, including the Lone Star pilot, but plan to in the next couple of days. Bravo, FOX! We had a little screening party over on the Westside and didn't get any chocolate either... what the??? It was a good pilot screener and I will be watching this season.... this is the kind of "taste test" marketing that helps get the word out.... especially with us social butterfly types who yack all the time!!! I loved the package...felt like santa came early this year. Thanks to Fox and Klout for making it fun. Wishing on a (Lone) Star for the show to have a long run. I think it's a great idea! I also think that the person putting the party package together is probably enjoying all the chocolate! Sukhraj: I bet your viewing party was a blast! TY for commenting! Ef: That seems to be the consensus. I haven't spoken with anyone who got the chocolate. What the heck? Thanks for chiming in, Ef! Matt: Thanks for visiting my blog and for taking the time to comment. I think you'll enjoy the pilot. Very different from the usual network programming. I concur; Bravo, FOX! Tom: I think you're probably right! I bet the shipping department is scarfing up all our chocolate! You're so smart! We need to plan a raid!